Simple Profits scam found at simpleprofits.co promises to help you make easy money online with their binary trading app. Stay vigilant and don’t be fooled, as Simple Profits is a scam. Read our in-depth Simple Profits review to find out the hidden truth. The alleged owner of Simple Profits scam, Mark Ford makes a huge boast on his system right off the bat. In the beginning of the sales video, he talks about how Simple Profits system is guaranteed to you make money, and how it is different from the other scams out there that makes false promises. It’s widely known that there are way too many binary trading software scams on the internet, and Mark is trying to differentiate himself by pointing out this fact. He claims that his Simple Profits system is different because the trading losses are protected. Is he telling the truth? Unfortunately no. In fact, there are so many red flags in the homepage of Simple Profits that you should take note of. Firstly, Mark uses an exaggerated and bogus headline above the sales video to catch the users’ attention and coerce them into watching the video. 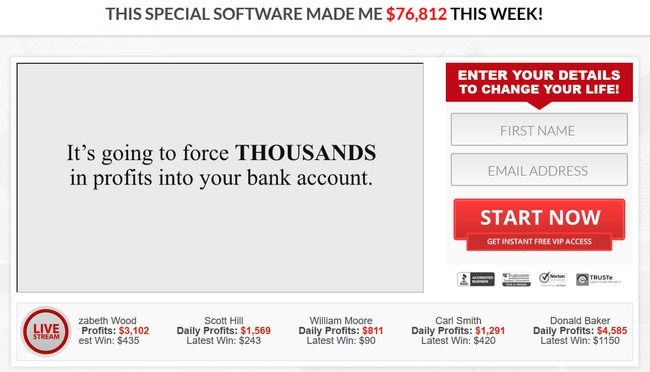 I mean, whoever is interested to make money online will be awestruck by a software that makes $76,812 a week! However, this is an overused trick in online scams, and can be seen in many other scams such as Secret Millionaires Club and Euro Millionaire Club scams. Within the sales video, Mark tries to convince you that his system can protect you from any losses because he’s using a hedging strategy. While it is true that hedging can be used in binary options, it can only minimize your losses, not preventing it. Not only that, finding the right setup is difficult because the right conditions don’t happen all the time. In the sales video, Mark tells you that on average 2 trades are taken every minute, and that is simply not true. Throughout the sales video, Mark’s only objective is to brainwash you into thinking that there is easy money to be made online through fully automated softwares such as Simple Profits. Let me tell you this – I’ve been a victim of various binary software scams before. There is no free lunch in this world. Simple Profits scam also uses questionable marketing tactics to force unsuspecting internet users into signing up for the “limited spots”. There is a counter on the right of the sales page that decreases as time passes. There is one easy way to find out it’s a fake counter – just wait till there’s only 1 spot available, and hit refresh on the browser window. 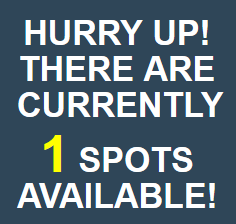 The number of spots available will return to 6. It’s just a computer script that resets and countdown every time you load the webpage. We’ll reveal the more conclusive proofs to show that Simple Profits is a scam at the later part of this review, as well as guiding you to the real way to make money online. Since this is a binary software scam, it’s necessary to talk about how binary trading works before we continue the review to make sure everyone is on the same page. If you have experience trading binary options, you may skip to the next segment. Binary trading is gaining popularity in recent years due to its simplicity. Compared to traditional investments such as the stock market, where you need to analyze charts and financial news, you only need to choose “Yes” or “No” in binary options. You trade by guessing if the price of an asset will rise or fall after a short period of time, usually between 30 seconds to minutes. Here’s how it works – let’s say I predict that the exchange rate of EURUSD will rise after 60 seconds, and I bet $50 on a 1-minute contract. When the time is up, and the rate is indeed higher, I win a certain percentage of what I bet, usually between 60% to 80% (between $30 to $40). But if I’m wrong, I lose the entire sum that I bet. In reality, trading binary options is very similar to gambling. There’s no good way to predict market movements in such a short period of time, and it’s impossible to get it right consistently. Can you guess the outcome of a coin toss with confidence? The odds is almost at 50-50. The same principle applies to binary options. You can find some FAQs in the homepage of Simple Profits scam. Among the answers, Mark Ford promises his members a 100% free software that is fully automated and places the winning trades for them. Since the losses will be hedged, there is no way to lose money using his software. The truths are in the disclaimer, but how many people actually read it? In the entire sales materials of Simple Profits, never has once did Mark Ford talk about the possibility of losing money with his software. You’ve been promised guaranteed profits because the losses are hedged. However, if you take time to read through the risk disclaimer of Simple Profits (found at the bottom of sales page in fine prints), you will realize that Mark has hidden some facts from you. Now, based on these few clauses above, we can find out the truth behind Simple Profits scam. Trading binary options with Simple Profits is risky and you are likely to lose all your investments. Despite coercing you to sign up for the software, you should not view Simple Profits as an invitation to trade binary options. If you do sign up, it’s entirely your own decision. Note: Scams like Simple Profits that promise exorbitant returns are illegal in many jurisdictions. If they do not include this clause, they are deemed to illegally coerce you to sign up for the scam. The profits shown in the sales materials are simulated results, no real trades have been executed using the software. To put it simply, the profits displayed are not real. Fact #3 alone should be enough to alert you to steer clear of the scam. These terms and conditions are not here to give you a fair warning as a consumer. The sole purpose of this document is to protect the scammers from legal actions when you lose all your money trading with Simple Profits software. You can’t take any legal actions because you signed up based on your own decision. If you decide to sign up for Simple Profits, you’ll have to register for a broker account through their sales page (which is an affiliate link). The scammers behind Simple Profits will earn a sum of referral fees as soon as you deposit into the account. 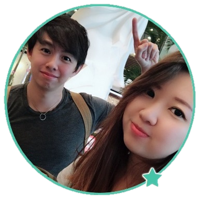 I was assigned to VXmarkets, an affiliated broker with Simple Profitx. The minimum deposit with VXmarkets is $250. Even if you already have an account with their recommended broker, you have to register for a new one using a different email address. This is because the scammers behind Simple Profits cannot collect their referral fees unless you sign up for a trading account through their affiliate link. YES, SIMPLE PROFITS IS A SCAM. As we’ve said in the review earlier, we don’t recommend binary options trading as a way to make money online, at all. It’s not that different from gambling, and using an automated trading software is no different. You are essentially putting your hopes and entire investment in a piece of software that gambles on your behalf.